I made a pain au levain the other week, a French sourdough shaped like a torpedo, and full of glorious air holes, encased in a brittle crust. It was a textbook example of why ‘slow is best’ when it comes to baking bread. The levain, or starter, was set up the night before, giving it a cool, cold early autumn evening to develop and build its structure and flavour. The difference that using a levain and letting it mature overnight was incredible – the finished bread tasted of time, tasted of every last bubble of carbon dioxide that the slowly growing yeast culture gave off in the dark, small hours as we all slept. That was real bread, bread with attitude. This is another type of continental bread that uses broadly the same technique to develop taste and a little backbone. This time, a normal yeast is used in the starter in place of a sourdough culture. The initial dough is called a biga, because this is an Italian bread … the French equivalent, a starter made with baker’s yeast, is a poolish. The biga lives in the fridge for anywhere between eight and seventeen hours before forming the basis for the bread dough, which itself goes through a long, slow fermentation to allow the dough to develop flavour and complexity. Don’t let anybody tell you that good bread can be made quickly – it simply can’t. Time is a vital ingredient in the very best of loaves. This bread, a panmarino, is bolstered with olive oil and flavoured with fresh rosemary. Rosemary goes with olive oil as well as fish goes with chips – they form a wonderful partnership, the olive oil providing richness and depth, the rosemary a piquancy that mellows and settles as the dough bakes. So, start with the biga. The biga is a rough little ball of dough that takes nothing to make – 65g of warm water, 100g of strong white bread flour and a couple of grams of instant yeast. Mix these basic ingredients together into a dough, knead to smooth it out for a minute or two, then put it into a bowl covered with clingfilm and let it rest for an hour at room temperature before transferring the bowl to the fridge until the next day. The next day is simply a matter of mixing a dough together, adding the biga, waiting, shaping and baking … but it takes hours to do. The dough is made from 300g of water, 500g of strong white flour, 64g of olive oil, 10g of coarsely chopped rosemary, 15g of salt and another 5g of baker’s yeast to give the dough a real kick-start. Stir the whole lot together until a dough forms, then knead until it becomes smooth and silky, a sign that the gluten has developed properly. This takes up to a quarter of an hour by hand, or about ten or twelve minutes in a stand mixer. Now for The Big Ferment. This part is the main act, the time when the finished bread is made, or not made very well, depending on whether you rush it or not. Put the dough into a large bowl, and cover with clingfilm, a plastic bag, or anything that helps to keep the atmosphere in the bowl leaning toward the slightly humid. The dough needs to ferment and rise for a couple of hours, until it’s doubled in size and springs back gently when prodded. Divide the risen dough into two, and shape each into a baton by first flattening the dough down into a rough square about 20cm across, then drawing the bottom third up into the middle, pressing on the seal, and then dragging the top edge right over to meet the bottom and pressing hard on that seal, as well. Use both hands to rock and roll the dough out to a length of about 40cm, pressing down slightly harder at the ends to taper the shape. Place each baton on a piece of floured greaseproof paper, about four inches apart and lift the centre of the greaseproof paper up so that the two pieces of dough are supporting each other, separated by the paper. Support the two outer edges with tightly rolled tea towels or clothes, cover with a plastic bag and leave to rise for another hour. To bake, score each of the loaves with a serrated knife and use a baker’s peel or a rimless baking tray to lift the loaves into the oven, onto a hot baking tray. Pour some boiling water into a tray placed on the base of the oven, and bake at 200c for between thirty and forty minutes, until the crust has turned a rich, dark brown colour. The olive oil in the dough means that the crust will be darker than a normal loaf – it isn’t burnt. The finished bread is rich and gently pungent, the rosemary baked through the loaf. It’s superb with simply grilled meat or fish – a meal of a pork chop, some salad and a couple of slices of this bread, lemon juice squeezed over the chop, would be hard to beat. 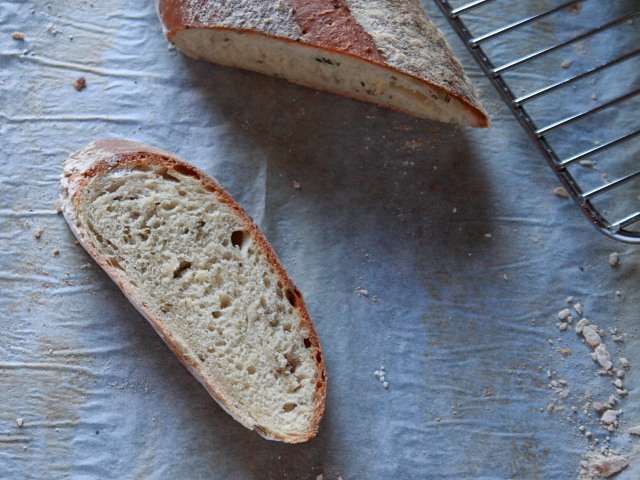 , by Daniel Leader … it’s an American book that looks at European regional bread, from the sourdoughs of France right through to the dark, heavy rye breads of Eastern Europe, and it’s become a vital fixture in my kitchen.